September 26th, 2014, was the USAG Ansach Combat Spouses Day. The Spouse Day is a common annual event at most Army posts. The activities of the day vary at different locations. This year, at our base, thirty six teams of soldier spouses (and community members) competed in events highlighting a soldier’s training. 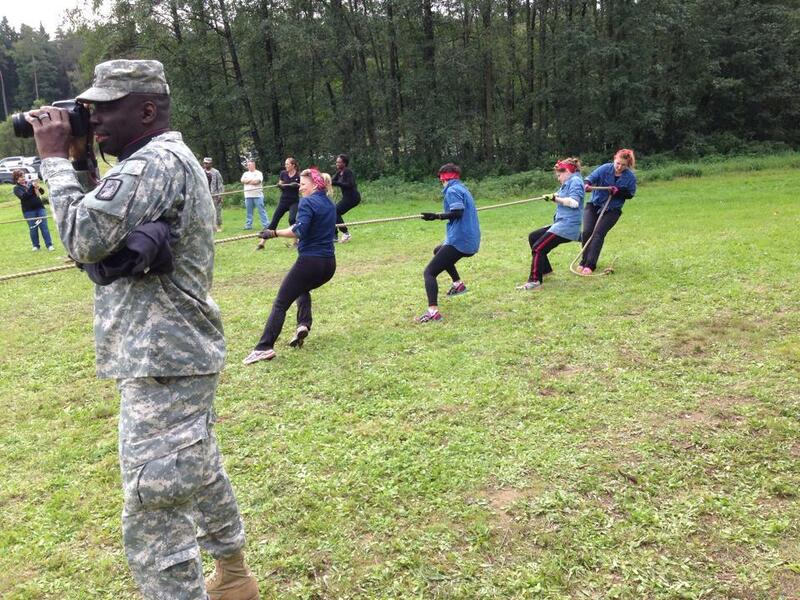 The challenges were grenade throwing, target shooting, carrying a wounded soldier to safety, capture the flag, tug of war, an obstacle course, trivia, crate stacking, and eating food prepared by the dining facility. Not being a soldier, I am often horrified by my husband’s army food stories, but the DFAC (dining facility) must have stepped-it-up for the spouses, because the food was alright. Don’t get me wrong. I’d still prefer to be eating tapas on the coast of Spain, but after a day crawling under barbed wire and running through mud it felt good to wash my hands at a port-o-sink and wait in line for scoops of mac-and-cheese and baked beans. 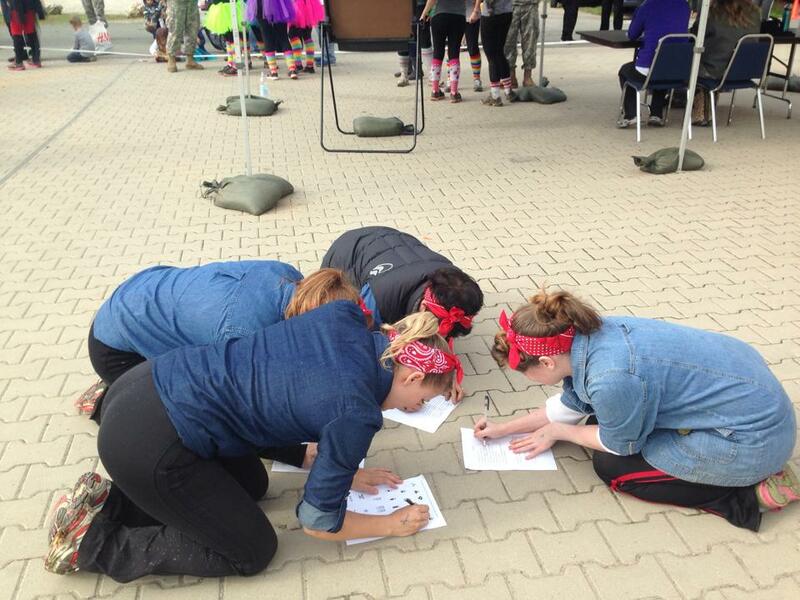 In addition to scoring points for the typical soldier challenges, teams could also gain points for having a team costume, team skit, and spirit/etiquette. All totaled it was a well rounded day with areas of success for all kinds. I like sports and fitness and teamwork, but I am not a competitive person. I had reservations about joining a team to participate in this day. In fact, I was a bit intimidated, and didn’t want to. The universe had other plans and I joined The Blackhawk Bombshells, with three other spouses from my husband’s Company. I didn’t know much about the other girls (nor they me) before working with them on this event. We soon found we had a lot in common; especially when it came to our attitudes (and insecurities) about the day. We had resolved to just have fun, not push ourselves to the point of failure, take our time, and not be the best but do it right. I think it was the best plan ever. We didn’t come in 1st place, but we did come in 4th. We were incredibly proud of ourselves, and were each satisfied in having pushed our limits and performed better than we had hoped. It was more Army fun than I’ve had in a while. I couldn’t have enjoyed this day so much, without having learned so much. In addition to a new t-shirt and some new friends, here’s what I took home. You never know how much fun something can be until you do it. So you gotta do it, even if you think you don’t want to. You get the opportunity to know people better, more personally, by working with them, not just chattng with them. On this day the four of us faced immediate problem solving and challenges together. We now know one another in a special way, and that won’t change. As intimidating (and uncomfortable) as stepping out of your comfort zone can be; it is even more rewarding to complete an activity you’ve never done. 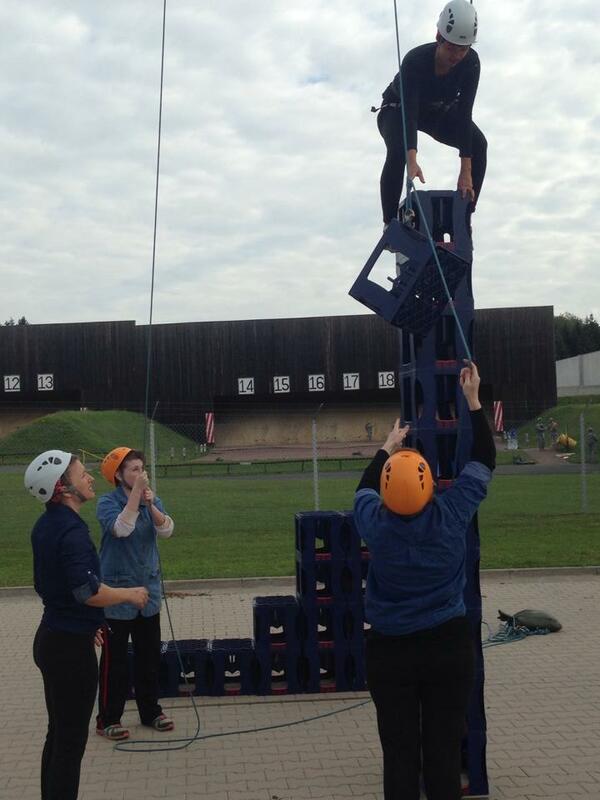 On this day, for me, it was exhilarating to climb, while building, a stack of crates and compete in tug of war. They were both a lot more fun than I thought. The added bonus was that I was way more successful at both events than I thought I would be. It feels good to be recognized and celebrated. It’s one thing to receive certificates for volunteering one’s time, but it is completely another to be given an entire day. There were many soldiers (and people) that made it a priority to gift us the opportunity to participate in a simulation of a soldier’s training. I am thankful to them and incredibly glad to have seized the day. This day is only one example of this type of opportunity; where spouses are able to challenge themselves, have fun, and do something unique. I encourage all spouses (and military community members) to keep their eyes, ears, and hearts open to these offerings at their own installations. It’s a wonderful way to boost your confidence in yourself and refresh your attitude about your environment. 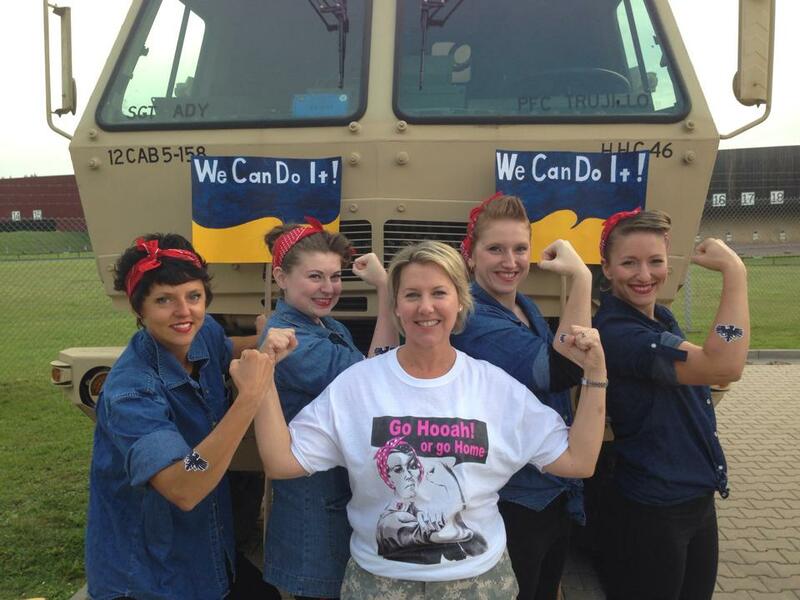 This entry was posted in Community, Uncategorized and tagged army, community, Rosie the Riveter, Spouse Day, Team Challenge.